Sometimes, hockey folks show off their stick skills in other sporting venues. Please recall Sidney Crosby of the Pittsburgh Penguins attempting 70-yard "field goals" with a hockey puck to promote the 2011 Winter Classic at Heinz Field, for example. Rather than pitching one to home plate, Boucher opted for something a little more hockey-centric: Taking a stick to the mound and shooting the baseball into the mitt of catcher Stephen Vogt, who also was carrying some hockey lumber. And a perfect strike, no less. Now why didn't Tom Glavine — MLB legend and Los Angeles Kings draft pick in 1984 — ever think of that? "I'd be a liar to say I'm not afraid (of a lengthy lockout)," Boucher said. "Especially as a group right now, the organization from top to bottom are very enthusiastic about the momentum we have with our fans and the building, the new players we acquired this summer. There is so much positive stuff going for us, it would be sad if (the lockout) was long. But you have to take care of the business before you get down to the fun part, and I'm lucky enough not to be part of it. I just sit on the fence waiting for both sides to get something done while staying positive until it gets done." 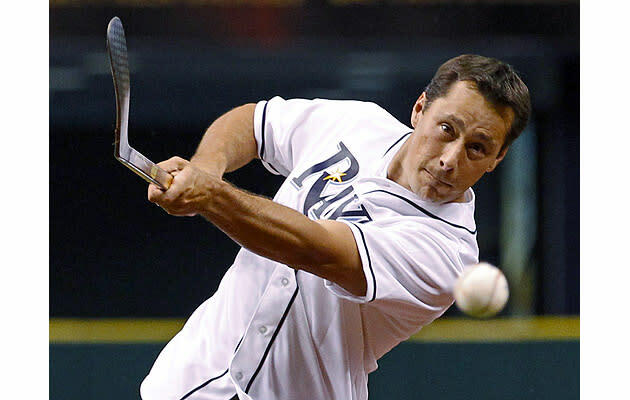 Hey, if the lockout does carry over into 2013, hopefully Boucher just earned an invite for when pitchers and catchers report.